In late Summer 2008, I wrote the following This I Believe essay. I share it with you because our story seems tragic and sad, and many parts of it are. But it’s not all bad. I believe that the purest joy can be buried within great tragedy – and sometimes, that that bleak wrapper helps joy shine that much brighter. In the summer of 2007, my husband Jamie and I were slightly surprised to find ourselves pregnant. After a series of difficult conceptions for many of our friends, we somehow assumed it would take us months to conceive. So the news that it took a mere six weeks filled us with a lot of surprise and frankly, more than a little consternation. After the initial shock, we became excited. Our first trimester passed without incident. We bought baby books and talked about how our lives would change. We argued over names and picked out cribs. We discussed and came to terms with our fear of becoming parents. In short, we behaved as many do during their first pregnancy. Around 16 weeks, however, our doctors suddenly got very serious. They asked us to come in more often. They whispered over ultrasounds. They took a lot of blood. They started talking about “outcomes,” and they had us see a lot of different specialists. By 22 weeks, I had been diagnosed with two auto-immune disorders, pre-eclampsia and various other issues. On December 21st, three days before my 30th birthday, I was admitted into the hospital for a still-birth delivery of our little girl. But here’s where the joy comes in. I wasn’t sure I wanted to see her. If anything, I was predisposed not to. I thought it would be easier. But in the hours before the delivery, I talked with Jamie who was planning to see her. I spoke with our amazing nurse Carrie at Brigham & Women’s, who volunteered for births like ours. She gave me insight as to why I might want to spend some time with our little girl. She wasn’t judgmental or pushy. She simply talked to me, and in talking with her and Jamie, I realized I would never get this moment back. And that no matter how hard it was, this might be our only child. And surprisingly, it wasn’t hard. It was beautiful. We got to see our daughter – with her little button nose and Jamie’s cute chin. We laughed over her big floppy feet. We marveled at how tiny she was. Of course there were tears. But strangely, they were tears shed with smiles on our faces. And in the end, I realized that despite everything, I am happy. Because my pregnancy experience, and yes, even its outcome, helped me to appreciate my life in a way I never had before. I am lucky. I have a husband that loves me. I have a family who supports me. An employer who let me take time off. Health insurance. An amazing hospital less than a mile away. Fantastic doctors and nurses. And I have a perfect memory of one half-hour that was more sweet than it was bitter, a half-hour that still brings a smile to my face even while it brings tears to my eyes. 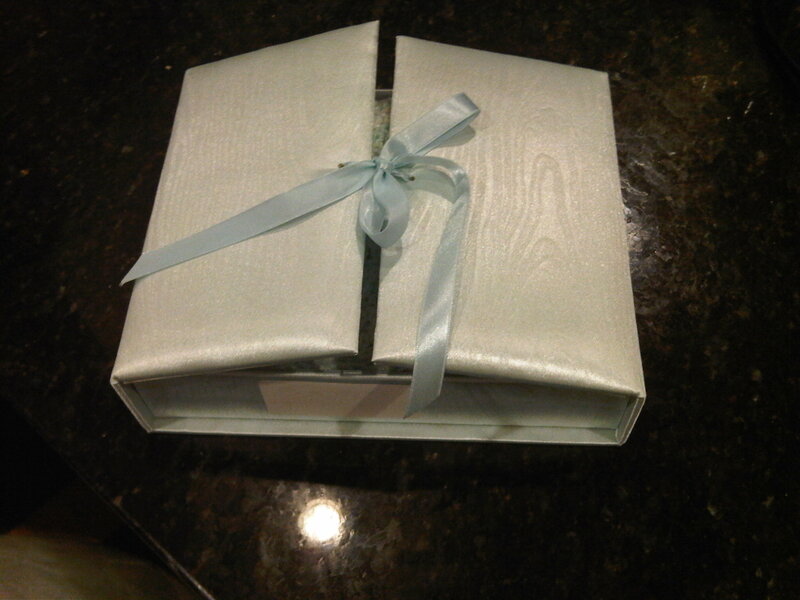 This is the box that Carrie put together for us to memorialize Baby Girl. Filled with pictures, blankets, hats and footprints, it's something we cherish. And this is Baby Girl's "Certificate of Birth" (note word choice there...). Yes, those really are prints of her tiny feet. Next up: A few final thoughts. This entry was posted in General and tagged APS, Health, Ick, ITP, Lupus, Parenting, Philosophy, Practical, Stories. Bookmark the permalink. Pingback: Practical Whimsy | I have one request. Have compassion. Wow. Thank you for sharing your story Lorita! Thanks so much for taking the time to read it, Celeste! Lor- Thank you so much for sharing this. I had no, being so far away and out of touch. That said it is articulate, thoughtful people like you that make these issues very real and help shade in those grays. I know this was a beautiful moment amidst the sadness, but right now I can’t even imagine spending a half hour with my stillborn child. I admire your strength and ability to find the goodness in a situation so bleak. I know this has to be hard to write, but thank you for doing it. Aaron – frankly, neither could I. When I went into the hospital, I had no intention of seeing her. I’m glad I did, but it’s not a decision that is right for everyone. I want to sincerely thank you for giving me the strength to write honestly about our experience. Had I not read your piece, I don’t know that I would have written this series – particularly not the part about the abortion protestors. My heart breaks for you and your family, and my thoughts are with you.